You are here: Home | Divorced Women | Co-Signing a Mortgage: Is It Worth The Risk? Co-Signing a Mortgage: Is It Worth The Risk? There are several circumstances that require co-signing for a mortgage. The most common scenario involves a married couple. The two incomes combine to sufficiently cover the cost of the monthly mortgage payment. Other cases include parents co-signing for their child’s first home; adult children co-signing for their aging parents whose income has diminished at retirement; siblings or friends helping each other out. The fact is, most people with good credit and assets can co-sign for someone else. Whether the co-signer feels a familial obligation or they just want to help someone, the question remains: Is the risk worth the reward? Let’s look at that married couple. What happens if they divorce in a few years and the wife remains in the home? While she has now taken over paying the mortgage, her ex-husband’s credit is still at risk, even though he is not making the payments. If she is late with her payment or defaults on it, they will equally share in the liability. There is an option to refinance, but what happens if the ex-wife does not qualify on her own? The ex-husband may choose to keep his name on the mortgage, especially when children are involved. In the case of friends or family co-signing, it is important to understand that what began as an act of kindness can quickly turn into a regrettable decision. When it comes to your hard-earned credit, you must consider the history as well as the potential of the person you’re signing for: Why is their credit low? Do they have a stable job history? Will their income increase over time? Do you trust that this person with poor credit and/or limited assets will take on and consistently pay a monthly loan over 15 or 30 years? Worst case scenario: As the co-signer, you are responsible for the loan if the homeowner defaults on the payment. If you already have a mortgage of your own to pay, you now have two. In addition, because the homeowner defaulted on the payment, your credit has taken a hit in the process. None of this is meant to say that all co-signed mortgages are a mistake. Many of them work out perfectly with no issues. The point here is understand your responsibilities as a co-signer and if you choose to proceed, be ready to take on the full responsibility of the mortgage. If you are recently divorced and need information about refinancing or if you have further questions about co-signing for a mortgage, please contact me at 617-965-1236 or email me. 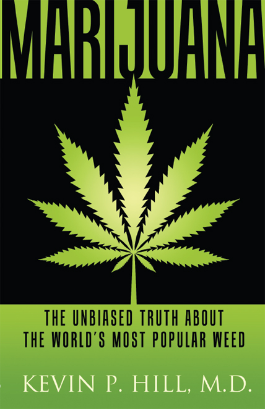 Marijuana: The Unbiased Truth About The World’s Most Popular Weed by Kevin P. Hill, M.D. Typically, this space is reserved for home improvement or gardening tips — although I suppose this could fall under “gardening.” My husband, Dr. Kevin P. Hill, had his book published recently and I am excited to tell everyone about it! Marijuana: The Unbiased Truth About the World’s Most Popular Weed, by Kevin P. Hill, M.D., explores the history and debunks the myths about this controversial plant’s colorful 2000-year history.